Will your driveway last for several more years, or is it time to replace it? Although repairing or resurfacing can extend the life of your driveway, there comes a time when you simply need to install a new driveway. Of course, a driveway is a major investment, so you don't want to replace it unnecessarily. Keep watch for the following five signs that can help you to determine whether it's time to replace your driveway. The winter months can be brutal on your driveway. When the spring melt comes, your eyes may behold a sad sight: a driveway that has significantly deteriorated over the last several months. What is it about winter that is so hard on your driveway? The primary reason that winter wears out driveways is that cold weather usually brings snow and ice. When this moisture melts, it can penetrate the surface of your driveway. As soon as the temperature dips again, the water within the driveway will freeze. Water expands when it freezes. The ice trapped in the driveway creates pressure within, and the pavement can crack as a result. Furthermore, winter is rough on driveways because many property owners--especially those responsible for commercial driveways--put down rock salt to melt snow and ice. Unfortunately, this can damage the top layer of the driveway. Learn more about this concern in the video "Winter Weather Special: Tips For Keeping Your Driveway, Sidewalks Clear." Additionally, since de-icers encourage melting, they contribute to the problem of moisture penetrating the pavement. Sealing your driveway on a regular schedule may help to prevent damage from winter weather, but eventually, the surface will need to be replaced. 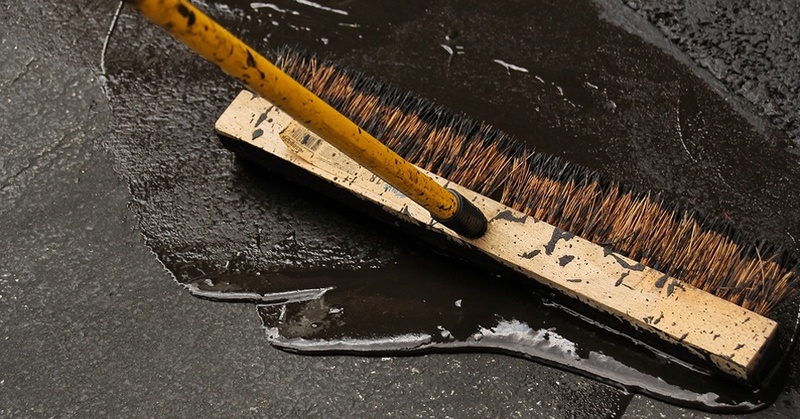 Be honest with yourself: Does a cracked, faded, crumbled driveway look good? No, quite the opposite. Driveways in need of replacement are ugly, and they can make your entire property look bad. The fact of the matter is that people judge your property based on first their impressions, and the look of your driveway can play a large role in that. Even more significant: People may judge you as a person or a business owner based on their first-impression evaluation of your property. Homeowners who are looking to sell may find that a shabby driveway turns away potential buyers. Business owners in need of driveway updates may find that a property's unkempt appearance costs them customers. Replacement is the best fix for old, unattractive driveways. When you replace your driveway, it will instantly boost the curb appeal of your property. Others will notice and be pleased with your efforts, and you'll feel proud of the care that you are putting into your property. When your driveway has acquired cracks or potholes in the past, you may have used DIY patching materials to repair them. This can be a decent short-term fix to get more life out of your driveway. However, DIY patches do not use the same materials as professional repairs, so they aren't a long-term solution for driveway damage. DIY patching materials cannot fully penetrate the nooks and crannies of the original asphalt, so small gaps will remain. Water will get into these gaps, and the damage that it causes can bring the cracks right back. You can only limp along with repairs like this for so long. Eventually, it will be time to break the cycle of patching and repairing and put down a new surface instead. You may be tempted to try repairing your driveway instead of replacing it in order to save money. Sometimes, that's a reasonable plan. Other times, however, the damage is too widespread for this to be your best course of action. When many repairs are needed, the cost can really start to add up. You may find that the total isn't that far off from the price of an all-new driveway. Plus, if your driveway is covered with problems, it can be a sign that the surface is nearing the end of its life. Even if you have the current problems fixed, new ones may soon crop up. A full replacement can be a more cost-effective approach than doing major repairs year after year. If you aren't sure which would be best for your situation, you can contact a paving company for a professional option. Professional pavers can let you know whether your driveway is a candidate for repairs and what the price difference between repairs and replacement would be. All of these can take their toll on the surface. Asphalt driveways may last around 20 years, and concrete ones can last up to 50 years. As you approach the upper limit of your driveway's potential lifespan, it's usually better to replace it than to try repairing it. Otherwise, you risk falling into the trap of performing expensive repairs year after year. A new, professionally installed driveway is an opportunity to start fresh, and the surface will last you for many years to come. Do any of these signs apply to your driveway? If one or more of them describe your property, it's time for a replacement. A professional paving company can remove the old, damaged surface and lay a new driveway that will last for many years. A new driveway is more reliable than a broken one, and it elevates the look of your entire property. For questions about driveway replacement, please leave a comment below.